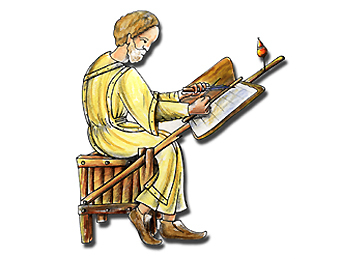 These illustrations represent several types of copyist lecterns from a variety of historical periods and from them, we can glean information about the work and sketches of copyists.. This is proposed as a way of beginning to understand what scriptoriums were like.. The illustrator Valle Camacho depicts medieval copyists clad in the robes that appear in the carved ivory of the coffer of San Millán, hence the ivory tone of the cloth. 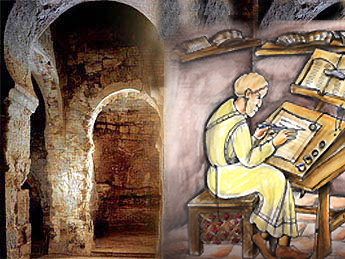 One of the illustrations is of a lectern from the Renaissance, complete with the tools used by the copyist. Discovering how the first books were made. Transporting yourself to life in the Middle Ages. The script of the past and calligraphy.